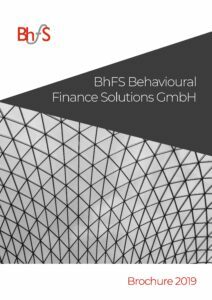 BhFS offers workshops and seminars in behavioural finance as well as other areas of finance to professionals in private banking. We present basic concepts in behavioural finance, especially in the context of their application to financial decision-making. We also offer in-depth presentations to your executive staff, as well as technical presentations on our methodologies and concepts. Overconfidence, availability bias, mental accounting, etc.